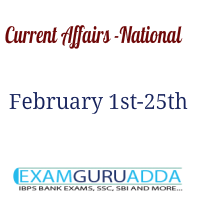 Dear Readers, we are presenting National Current Affairs of 1st February to 25th February 2017 for Bank and SSC exams. 1. The Union Ministry of Urban Development approved development of 6 km long Bet Dwarka Darshan Circuit in Gujarat under Heritage City Development and Augmentation Yojana (HRIDAY). 2. The Trade Facilitation Agreement (TFA) in Goods of World Trade Organisation (WTO) came into effect with its ratification by two-thirds members of WTO including India. The TFA in Goods was adopted by the WTO Members in 2014. It aims to streamline, simplify, standardise and ease customs procedures and norms. It will help to cut trade costs around the world. 3. Sikkim became 22nd state in the country to join Union Government’s Ujwal DISCOM Assurance Yojana (UDAY). 4. The Central Board of Excise and Customs (CBEC) has launched a mobile application for Goods and Services Tax (GST) to inform the taxpayers of the latest updates on GST. 5. Indian Railways has unveiled Antyodaya Express, a new train for the unreserved passengers. It was unveiled by Union Railway Minister Suresh Prabhu in New Delhi’s Safdarjang station. The first Antyodaya Express is slated to start between Mumbai (Maharashtra) and Tatanagar (Jharkhand) and second between Ernakulam and Howrah. 6. The first Strategic Dialogue between India and China was held in Beijing, capital of China to shore up bilateral ties. The meeting was co-chaired by India’s Foreign Secretary S Jaishankar and China’s Executive Vice Foreign minister Zhang Yesui. 7. The Cabinet Committee on Economic Affairs (CCEA) has approved the enhancement of capacity from 20,000 MW to 40,000 MW of the Scheme for Development of Solar Parks and Ultra Mega Solar Power Projects. 8. The Cabinet Committee on Economic Affairs (CCEA) has approved investment for the generation component of 900-MW Arun 3 hydropower project for an estimated Rs. 5723.72 crore ($854.4 million). The project is located on Arun River in Sankhuwasabha district of eastern Nepal. 9. The Union Cabinet has given its approval for signing of an Agreement between India and Poland on cooperation in the field of agriculture and allied sectors. 10. Union Cabinet chaired by Prime Minister Narendra Modi has approved the signing of Air Services Agreement (ASA) between India and Greece. 11. The Union Government has launched Bharat QR code, a quick response (QR) code to enable digital payments without card swiping machines. It is world’s first interoperable payment acceptance solution launched by Indian Government to move towards less-cash economy. 12. The Union Ministry of Electronics and Information Technology (MeitY) has launched Cyber Swachhta Kendra in New Delhi for Botnet cleaning and Malware analysis. 13. The International Mother Language Day (IMLD) was observed across the world on 21 February to promote awareness of linguistic, multilingualism and cultural diversity. This year it is the 17th anniversary of IMLD. 15. The Union Ministry of Health and Family Welfare has launched SAATHIYA Resource Kit and SAATHIYA SALAH mobile app for adolescents as part of the Rashtriya Kishor Swasthya Karyakram (RKSK) programme. The kit and app will help Peer Educators (Saathiyas) who are introduced under the RKSK programme. 16. The Union Government has announced the expansion of rotavirus vaccine in five additional states under Universal Immunisation Programme (UIP). They are Assam, Tripura, Madhya Pradesh, Rajasthan and Tamil Nadu. 17. The Union Ministry of Textiles and Ministry of Social Justice and Empowerment have signed MoU to step up interventions for the welfare and economic development of scheduled caste artisans. 18. According to scientists from Goa based National Institute of Oceanography (NIO), India’s only live volcano at Barren Island in the Andaman and Nicobar has become active again. 19. The GST Council has approved a law to compensate states for any loss of revenue from the implementation of the new nationwide indirect taxation regime. The meeting was held in Udaipur, Rajasthan first time outside national capital. It was headed by Union Finance Minister and attended by representatives from all states. 20. India’s vaccine regulatory body NRAI (National Regulatory Authority of India) was given the maximum ratings by the World Health Organisation (WHO) for vaccine regulations. 21. India was ranked 143rd out of 186 economies in the annual Index of Economic Freedom 2017 that measures the degree of economic freedom in the countries of the world. The index was released by top US based Think Tank, The Heritage Foundation. 22. The Supreme Court has introduced Middle Income Group Scheme, (MIGS) a self-supporting scheme for providing legal services to the middle and relatively lower income groups. 23. The Union Cabinet chaired by the Prime Minister Narendra Modi has approved the merger of State Bank of India (SBI) with five of its associate/subsidiary banks. These five subsidiary banks are State Bank of Bikaner and Jaipur, State Bank of Hyderabad, State Bank of Mysore, State Bank of Patiala and State Bank of Travancore. The Union Cabinet also approved the introduction of a Bill in Parliament to repeal the State Bank of India (Subsidiary Banks) Act, 1959 and the State Bank of Hyderabad Act, 1956. 24. The Union Cabinet chaired by the Prime Minister Narendra Modi has approved introduction of Bill in Parliament to extend the jurisdiction of the Collection of Statistics Act, 2008 to Jammu & Kashmir. The Amendment will be pertained to statistics under Union (List-I) and Concurrent lists (List- III) in the Seventh Schedule to the Constitution and Constitution (Application to Jammu & Kashmir) Order, 1954. 25. The Ministry of Mines has launched Transparency, Auction Monitoring and Resource Augmentation (TAMRA) Portal and Mobile Application to ensure transparent award of statutory Clearances for mining operations The TAMRA platform was simultaneously launched across 12 mineral rich states as a part of the Ease of Doing Business in the Mining sector and to double mining contribution to GDP. 26. The Union Cabinet chaired by Prime Minister Narendra Modi has approved establishment of Food Legumes Research Platform (FLRP) at Amlaha in Sehore, Madhya Pradesh with Satellite Hubs in West Bengal and Rajasthan. 28. The Food Safety and Standards Authority of India (FSSAI) has constituted a Panel on Food Fortification and Nutrition to identify critical nutritional gaps in the Indian diet in general and also in specific target groups. The 11 member panel will frame final regulations on fortification of foods and prepare strategies to address malnutrition problem. 29. India has joined Network for Improving Quality of Care for Maternal, Newborn and Child Health, a global health network focused on improving the quality of care for new mothers and babies. The network is supported by World Health Organisation (WHO), United Nations International Children’s Fund (UNICEF) and other partners. 31. According to a new study of global air pollution India’s rapidly worsening air pollution is now surpassing China’s as the deadliest in the world. 32. The Department of Atomic Energy (DAE) has planned to develop large deposits of uranium found in Meghalaya to tap its potential to generate substantial nuclear fuel for atomic power plants in the country. 33. India is planning to host a conference on counter-radicalisation with the Association of Southeast Asian Nations (ASEAN) in October 2017. It will provide common platform to countries for sharing experiences and ideas on prevention of radicalisation amid rise of Islamic State and other extremist ideologies. 34. The Union Government is planning to come out with ‘Indradhanush 2.0’, a comprehensive plan for recapitalisation of public sector lenders. Indradhanush 2.0 will be finalised by Reserve Bank of India (RBI) after completion of Asset Quality Review (AQR) which is likely to be completed by end of March 2017. It aims to clean up the balance sheets of PSBs to ensure banks remain solvent and fully comply with global capital adequacy norms, Basel-III. Besides, revised programme of capitalisation will be also issued as part of it. 35. The Union Government is targeting an investment of about Rs. 2,200 crore in start-ups working on new technologies in the electronic sector under the Electronics Development Fund (EDF) by 2019. 36. The National Productivity Day is observed every year on February 12. Besides, February 12-18 is observed as National Productivity week throughout the country. The main observance of day is organised by National Productivity Council (NPC) for encouraging all stakeholders in implementation of productivity tools and techniques with contemporary relevant themes. 37. The Union Government has constituted inter-departmental task force comprising members of various regulatory Ministries and enforcement agencies to crack down on benami firms. 38. The Appointments Committee of the Cabinet (ACC) has appointed senior bureaucrat Ajay Tyagi (58) as the new chairman of the Securities and Exchange Board of India (SEBI). 39. The National Deworming Day is observed every year on February 10 with main objective to combat parasitic worm infections among preschool and school-age children across India. 40. Union Railway Minister Suresh Prabhu unveiled the first phase of the ambitious Station Redevelopment Programme. It is the world’s largest transit-oriented development programme ever executed. As part this programme, tenders are being floated for 23 of a total of the total 400 A1 and A category stations selected re-developing in the first phase. 41. The Union Ministry of Commerce and Industry has launched pilot Revenue Insurance Scheme for Plantation Crops (RISPC) for protecting the growers from the risks such as pest attacks, yield loss and income decline caused by fall in prices. 42. The Union Human Resource Development (HRD) Ministry has constituted a sub-committee of Central Advisory Board of Education (CABE) to look into issues of girl’s education. It will be headed by Telangana’s Deputy Chief Minister and Education Minister Kadiyam Srihari. It will submit its report to the Union government within one year. 43. Kerala’s Nilambur teak known internationally for its superior timber quality and elegant appearance will be added to the list of Kerala produces with the Geographical Indication (GI) tag. 44. India and United Kingdom (UK) have signed a MoU (Memorandum of Understanding) to ease restrictions on the number of scheduled flights between the two countries. The MoU was formally signed by Union Minister of Civil Aviation Pusapati Ashok Gajapathi Raju on behalf of India and Lord Tariq Ahmad of UK during his visit to India. 45. The Reserve Bank of India (RBI) has decided to set up an inter-disciplinary Standing Committee on cyber security to examine various threats and suggest measures to deal with it.The committee has been set up based on the recommendations of the expert panel on information technology examination and cyber security headed by Meena Hemachandra. 46. The Union Cabinet has been apprised of the signing of the Memorandum of Understanding (MoU) of Cooperation in the field of Science and Technology and innovation. The MoU was signed between India’s Technology Development Board (TDB), Department of Science & Technology and France’s public Investment Bank Bpifrance. 47. The Union Cabinet has been apprised of the Framework Agreement between India and Vietnam on cooperation in the exploration and uses of outer space for peaceful purpose. 48. The Union Cabinet chaired by the Prime Minister Narendra Modi has approved ‘Pradhan Mantri Gramin Digital Saksharta Abhiyan’ (PMGDISHA) to make 6 crore rural households digitally literate by March 2019. PMGDISHA is expected to be one of the largest digital literacy programmes in the world. This approval comes in line with the announcement made by Union Finance Minister in the Union Budget 2016-17. 49. The Union Ministry of Health and Family Welfare has launched Measles Rubella (MR) vaccination campaign in the country at Bengaluru, Karnataka. It is largest ever in any campaign against these two diseases will start from five States/UTs viz. Karnataka, Tamil Nadu, Puducherry, Goa and Lakshadweep covering nearly 3.6 crore target children. 50. The Union government has formed a six-member committee to study the ways to improve India’s Haj policy and look into the issue of subsidy to the pilgrimage in light of a 2012 Supreme Court order on gradually reducing and abolishing it by 2022. The convenor of committee is Afzal Amanullah, former Consul-Consul General of India in Jeddah. 51. The Union Ministry of Human Resource Development (HRB) will soon set up a department – National Testing Agency (NTA) to conduct examinations for higher and secondary education. 52. The International Day of Zero Tolerance to Female Genital Mutilation (FGM) is observed every year on February 6 to raise awareness of the practice of FGM and work towards its elimination. It is sponsored by UN, 2017 Theme: “Building a solid and interactive bridge between Africa and the world to accelerate ending FGM by 2030”. 53. The Union Ministry of Railways and Italy’s public sector rail company Ferrovie Dello Stato Italiane Group (FS Group) has signed MoU for technical cooperation in rail sector especially in the area of safety and modernisation. 54. The National Institution for Transforming India (NITI) Aayog and Confederation of Indian Industry (CII) jointly launched India Innovation Index. Besides country’s first innovation index portal was also launched. The index has been jointly developed by NITI Aayog, DIPP and CII in consultation with World Economic Forum (WEF), World Intellectual Property Organization (WIPO), Cornell University, UNIDO, ILO, OECD, UNESCO, ITU etc. 55. The Union Government has announced two measures in the Budget 2017-18 to bring in greater transparency in funding of political parties. These include capping cash funding by a single anonymous donor to Rs. 2000 (one tenth of the current limit of Rs 20,000) and introduction of the electoral bonds. It will take effect from 1 April, 2018. 56. Union Finance Minister Arun Jaitley in his Budget Speech 2017-18 announced corpus of Rs 500 crore for setting up Mahila Shakti Kendras in the 14 lakh ICDS Anganwadi Centres at village level. 57. The Union Health Ministry has notified new rules for medical devices to remove regulatory bottlenecks and ensure availability of medical devices for patients. Under the new rules, manufactures will not be required to renew licenses periodically and submission of applications and grant of licenses will be done online. 58. The Union Government has singed Financing Agreement for IDA credit of $201.50 million with World Bank for the ‘Third Technical Education Quality Improvement Programme’ (TEQIP III). 59. India and Sri Lanka have signed Memorandum of Understanding (MoU) to construct a new multi-ethnic tri-lingual secondary school in Polonnaruwa District of Sri Lanka. The MoU was signed by of India’s High Commissioner to Sri Lanka Taranjit Singh Sandhu and Secretary to the Sri Lanka’s Ministry of Education Sunil Hettiarachchi. 60. The two-day meeting of SAARC Programming Committee was held in Kathmandu, capital of Nepal. All eight members participated in the meeting. 61. Union Finance Minister Arun Jaitley presented the Union Budget 2017. It was fourth annual budget presented by Arun Jaitley as Finance Minister. This was also first time no separate Railway Budget was presented. 62. The Economic Survey 2016-17 tabled in Parliament has advocated for the concept of Universal Basic Income (UBI) as an alternative to the various social welfare schemes in an effort to reduce poverty. It suggests that a more efficient way to help the poor will be to provide them resources directly, through a UBI. It will be an efficient substitute for a plethora of existing welfare schemes and subsidies. 63. India and Russia have held high-level consultations on counter-terrorism issues in New Delhi. Both sides shared views and assessment on the threats posed by increasing terrorist activities including India’s concern on state-sponsored, cross-border terrorism. 64. The Income Tax Department (ITD) launched Operation Clean Money (Swachh Dhan Abhiyan), an e-platform to analyse large cash deposits made during the demonetisation window (9 November to 30 December 2016).